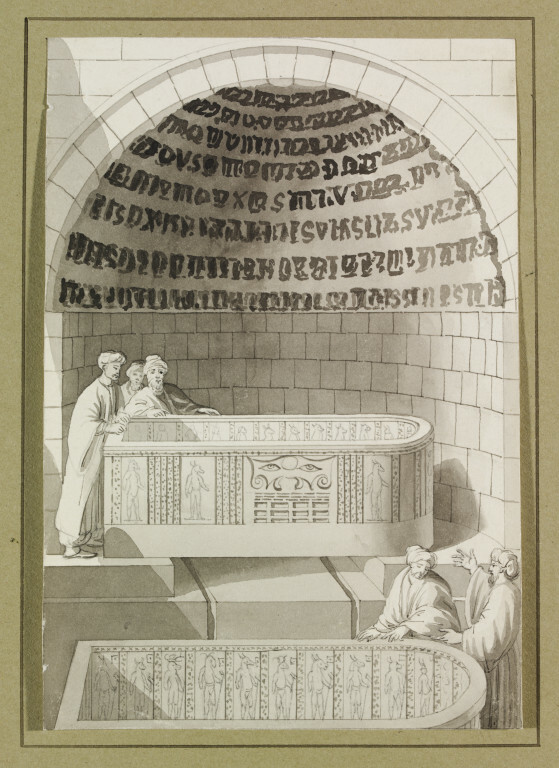 This is one of a group of views [SD.664:1-16] related to plates in L. Mayer, Views In Egypt, 1801-04 [see SP.376] and to a plate in F.B. Spilsbury, Picturesque Scenery In The Holy Land And Syria, 1803 [SD.664:15, and see SP.564]; and another [SD.664:16] probably related to an unidentified publication. SD.664:2 is related to Mayer, Egypt, Pl.10. 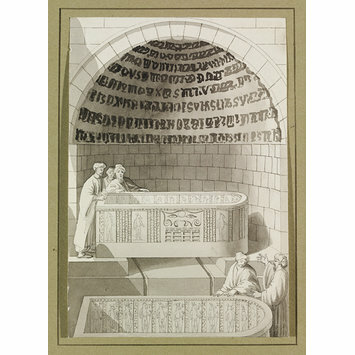 These drawings after Mayer and Spilsbury may be by an engraver re-drawing and simplifying the images for later and smaller edition incorporating plates from the works quoted above: for example, in the case of Mayer, possibly A Selection of the most interesting ...Views in Egypt, Asia Minor, &c. &c., published by R. Bowyer, 1812, or, in the case of Spilsbury, the edition published by G.S. Tregear, 1823: see Abbey, pp.320 & 333. Alternatively they may be copies drawn from any one of the several editions of these works. SD664:16 is similar in size and medium and is also mounted in the same way as SD.664:1-15, but slight stylistic differences suggest that it may be by another hand. Titles and plate numbers given are those of the aquatints in the first editions of the Mayer and Spilsbury volumes (1801 and 1803 respectively): see Abbey 369 and 381. For SD.664:16, the title is as inscribed on the mount.